Wheel hop is still an issue in all the S197 stick axle cars. Mostly because Ford puts squishy rubber bushings everywhere as to keep things quiet and comfortable for the average Mustang driver, even those plunking down the $$ for a 200mph GT500. Something tells me the new IRS will be limited by bushings as well, but with an upgrade should be a blast. Switching from rubber to delrin in my IRS was night and day. Good point. Did the Delrin bushings increase harshness, noise, or vibration? If so, it's understandable why they don't come that way from the factory. If not, the price difference must be significant for them not to do it from the factory. I doubt higher end brands run into this wheel hop issue with their IRSs. I guess fast + good handling + smooth + quiet = LOTS OF $$$$$$. SonicVenum wrote: Good point. Did the Delrin bushings increase harshness, noise, or vibration? If so, it's understandable why they don't come that way from the factory. If not, the price difference must be significant for them not to do it from the factory. I doubt higher end brands run into this wheel hop issue with their IRSs. I guess fast + good handling + smooth + quiet = LOTS OF $$$$$$. The delrin actually smoothed out the rear end and makes the car feel like it rides 'smoother'. My chick even noticed that difference, which is saying something. I didn't notice any additional noise, but my diff is mounted with aluminum front and rear, so that makes the most noise of anything. Sounds like a good choice, then. My Notch has solid spherical bushings at every mounting location front and rear. The only "cushion" anywhere in the suspension is in the prothane spring isolators, which don't do much. When I run over a coin in the road, I can tell what year it was minted. It's what makes me think putting sway bars and a brake upgrade on the car would make it a fun little track day car, especially now that it's N/A again. jhwalker wrote: I think the Terminator will get it's due at some point. Probably just needs more publicity of its "legend" for the general public to become aware of what an amazing car it was for its time making it legendary. Today, the Terminator is an easy 600+ with a small blower swap. That puts it up there with the latest muscle cars of today and tomorrow, which are now all blown: Camaro ZL1, Shelby GT500, Challenger Hellcat, and Corvette Z06. If the general public and maybe even more enthusiasts knew that all was needed was an "updated" to 2014 standards blower, I think this car would get its props. The Terminators were a good factory hot rod for their time, and, an improvement on the Buick Gran National, for instance. However, the Lightning was around prior to the Terminator and Ford sort of put together an assortment of parts on the old Fox Body to make the Terminator. Ford did include some stout parts in the block and some nice heads, so the basic engine was strong and mod friendly. The clutch and drive shaft and IRS and brakes and all the rest were not as robust, and the car has a sort of primitive feel about it, which some enjoy, but which apparently doesn't resonate with the general car buying public based upon the performance of the recent Camaro versus the Mustang. Now, there are a bunch of cars that easily eclipse the performance of the Terminator, which is still saddled with a transmission that can have various issues, and a clutch that won't last too long if it is seriously drag raced, and a weak aluminum IRS from the T-Bird and Lincoln, and poor brakes, and an ancient chassis which limits tire size and is not all that sophisticated. In '03-'04 and for a bit longer, a 500 RWHP Terminator had a real advantage as a street driven car on pump gas while drag racing, but, now, there are plenty of factory vehicles with less curb weight, and/or more HP than any Terminator. You just have to see how far Carlos has taken his Terminator over the years to attempt to hang in road racing and roll racing, but, he is not even in the ball park with a relatively stock late model Vette, let alone some of the really expensive hopped up German and Italian cars. They are too light and slippery and/or too powerful, and, they all handle and have powerful brakes, etc. So, the Terminator is sort of a mile stone, as it seems that the horsepower and performance wars have continued to ramp up since it was introduced, and, it may hold its value well over the years. But, I doubt that it will become a true classic with huge value as, at the end of the day, it is only an old Fox Body Mustang, and they made quite a few of them, and it doesn't even have a giant nav screen built into its dash. The people have spoken and they want bling, not raw performance. All that said, I miss my Terminator but I am also old school and I have no smart phone, or real time navigation, etc. 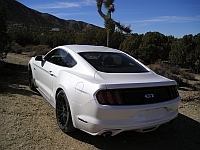 I owned lots of Mustangs over the years, including a 1998 Cobra and a 2001 Cobra, and the Terminator was by far the best Mustang that I ever owned, including my current 2012 auto trans 5.0 slug. But, there is no question that the 5.0 slug is smoother and less demanding to drive and much more civilized than the old Cobra. Everything works better and it gets 50% more fuel mileage as well. It even makes more RQHP and RWTQ stock, right out of the box, than the Terminator made stock. And, it has almost exactly the same curb weight. Which means that it is as quick, or quicker, than a stock Terminator. But, it is so refined that it is no fun, from my perspective, to drive....... But, what do I know? "Now, there are a bunch of cars that easily eclipse the performance of the Terminator"
Part of what was special about the Terminator was that with the pulley swap, the cold air intake, a gear swap, and the right tires --- it was/is a beast. Compared to the competitors, it is solid like a rock. Remember the broken Vette procession -- and they were the "on paper" beast. The early 60's "super cars" were 14 second cars. I never saw a stock one. The 2003-4 Termi (with the simple mods) is an 11.5 car. Heavy, balky at times shifter, all of the faults -- too many of us ran mid-11s. I don't know another car that has done that. I say we all owned (and some still own (lucky bastards))very special cars.